The cost of labor is a common theme for most growers in North America. And that’s if you can find the labor to begin with. It’s therefore not surprising to see labor-saving initiatives being vigorously researched and implemented wherever possible. The usage of robotics and automated machinery is constantly rising and has become a profitable industry for equipment manufacturers. Aside from reducing the cost of labor, the use of automation lends itself to make the tasks easier to perform. Repetitive movement is one of the more common workplace hazards and has been shown to lead to injuries. Equipment manufacturers are keen to demonstrate the level of automation their machines can function with. Another reason why some companies opt for automated processes is in relation to food management. Some of the latest grading machines have the ability to scan fruit and vegetables internally as well as externally, and then automatically direct each piece of fruit or vegetable accordingly. For example, many growers are turning to this technology to grade their produce automatically instead of by a worker who might only scan the external qualities. According to Lee, such technologies represent the ‘biggest revolution’ for the industry. 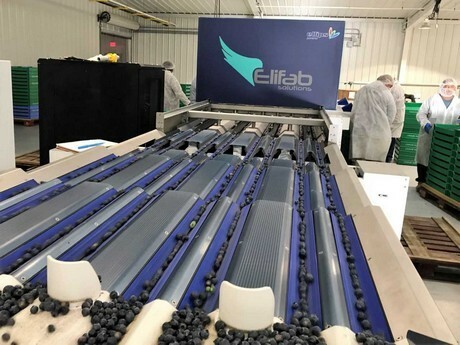 In line with reducing food waste and optimizing production, Elifab have recently launched a new blueberry sorter which the company says can scan 45 pieces of fruit a second. The machine will be shown at PMA Fresh Summit this month, the first show in North America to display the Elifab blueberry sorter. Lee said Durand-Wayland, the distributor of the Elifab technology, will also have other equipment to discuss at PMA. He added that the PMA Fresh Summit provides a great opportunity to speak and interact with customers and peers without the distractions of the office. Additionally, it gives companies a chance to share news with their customers.